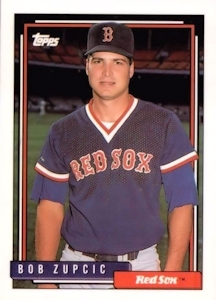 ON THIS DATE (June 30, 1992) ... Bob Zupcic hit a ninth-inning grand slam on a 3-and-1 pitch from Tiger closer Mike Henneman in an 8-5 walk-off, to cap a night that, before the fireworks, was not typical of Red Sox games this year. The Red Sox scored three runs in the second inning after falling behind, 5-0. That 5-3 score held steady until the eighth when the Sox pulled within one run. Then, in the ninth, the big hit before the slam was Scott Cooper's pinch-hit double, after another Pawtucket alumnus, Phil Plantier had walked. Jody Reed was walked intentionally to load the bases, then Zupcic launched a Henneman fastball. Pitcher, Daryl Irvine pitched three scoreless innings in relief of Mike Gardiner, who left after six innings. He allowed two hits and handled the biggest of the Tiger hitters with the aplomb of a veteran. In the seventh, Irvine struck out Travis Fryman, the first batter he faced. He then struck out Cecil Fielder, and got out of the inning after walking Mickey Tettleton when he induced a grounder by Dan Gladden. Tiger starter Wedsel Gary (Buddy) Groom Jr., a lefthander, pitched well in his third major league start, holding the Red Sox to three runs on four hits in 6 2/3 innings and had retired 10 in a row before Plantier struck for a two-out single in the seventh. The Sox pulled within one run the next inning when reliever John Doherty surrendered an opposite-field double to Tom Brunansky that scored Boggs from first. With Bruno at second and one out, Jack Clark grounded to shortstop and, for some reason, Brunansky tried for third and was gunned down. The Tigers scored five runs in the second inning with two outs. After a walk by Fielder and a single by Tettleton, Dan Gladden knocked into a double play. But Gardiner walked Scott Livingstone and allowed an RBI single to Chad Kreuter. He walked Milt Cuyler to load the bases, then launched a wild pitch to score the second run. With runners at second and third, Tony Phillips drilled a double to right, scoring both. Sweet Lou Whitaker drilled a single up the middle, accounting for the final Tiger run of the game. The honeymoon ended for Groom in the bottom of the inning, when the Sox scored three. After Brunansky singled to center, Groom walked Clark and Mo Vaughn to load the bases. A grounder to shortstop by Luis Rivera forced Vaughn at second and got the first run in. Phil Plantier lofted a sacrifice fly to center for the second run. Pena doubled to left, down into the corner, but was picked off second when he rounded too far.g Mel Hall's arm and making it.